This competition is open to all Malaysian citizens and fall into few categories. Recognition and diffusion of the winning images and finalists will be widely exposed throughout the contest websites, the media and the informational materials related to subsequent competitions. If sponsors are secured, it may be possible for co-coordinators to award material or cash prizes.
" Participant entitlement: T-Shirt, goodies bag, framed photo & souvenir "
Each individual can only win one prize or prize package. Participants are allowed to use any type of digital camera (DSLR, GOPRO & others). Participants must use the online form (online) to submit their entries. The image must be in JPEG format, high resolution (300dpi) image size that is not exceed than 5,000KB. An image can be uploaded only into one category. All photo entries will become the property of organizer _Nielky International Sdn Bhd. Each entries will be judged by a panel of independent professional jury appointed by the organizers. Rating and Judging are based on compliance with competition rules as stated. The judges decision is final and no objections have been received. Note: Entrants should retain high-resolution files of their submissions. 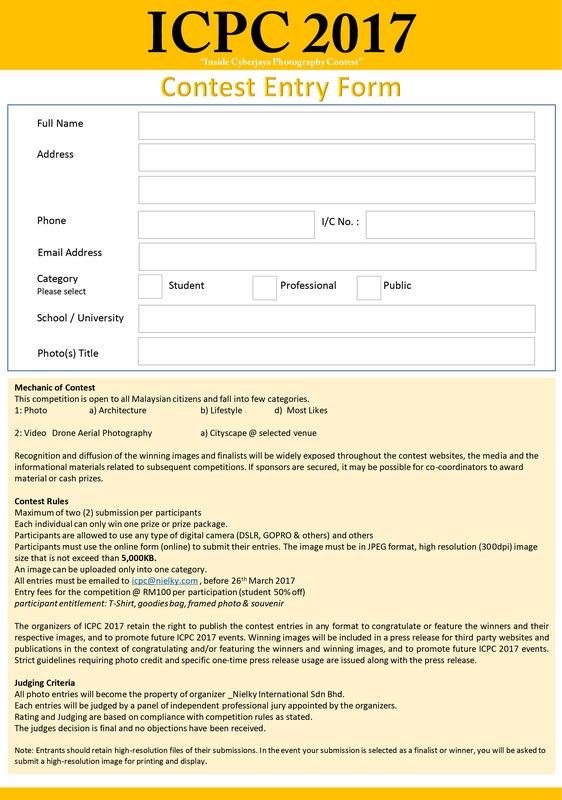 In the event your submission is selected as a finalist or winner, you will be asked to submit a high-resolution image for printing and display.